Why would I need self storage in Hollywood, FL? There are a variety of reasons why you might need self-storage in Hollywood, FL. How much is a storage unit in Hollywood, FL? The cheapest storage unit in Hollywood, FL is $39.00 per month. What size storage units do you have available in Hollywood, FL? In Hollywood, FL we have sizes that range from 3'x3' to 10'x30' to suit your storage needs. How much is it for a 3'x3' storage unit in Hollywood, FL? The cheapest 3'x3' storage unit in Hollywood, FL is $64.00 per month. Hollywood is a coastal community situated about halfway between Miami and Fort Lauderdale. It offers residents a South Florida hometown feel with a world-class beach and access to amazing arts and luxury amenities. Hollywood is one of Florida's largest cities, home to a growing and diverse population. As a resident of Hollywood, you'll enjoy a range of amenities and attractions, many of which draw thousands of tourists every year. The year-round warm weather in Hollywood makes it a popular vacation destination, like many other neighboring Florida cities. Its 7 miles of sandy beaches, dotted with dozens of luxury hotels, are another major attraction. 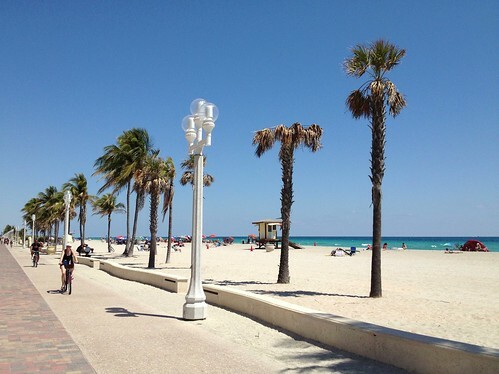 There are more than 60 parks in Hollywood, and the 2.5-mile brick-paved Hollywood Beach Boardwalk is used by joggers, cyclists and pedestrians. Hollywood's historic downtown is alive with entertainment, cultural arts and thriving businesses. There you'll find hundreds of concerts, dance exhibitions, shows, music festivals and art exhibits each year. The ArtsPark at Young Circle is a dynamic 10-acre circular park downtown, where you'll find a broad range of visual and performing arts as well as recreational, educational and entertainment activities ranging from salsa dance classes to live glass blowing. Another main feature of Hollywood is Port Everglades, the second-busiest cruise port in the world and home of the largest cruise liners in the world. It's not uncommon for residents of Hollywood to drive to nearby cities for work, but the commute can be tough, especially if you're planning to travel to Miami. However, taking advantage of public transportation can save you time and stress. Or you can search for a job within Hollywood's city limits, where there are plenty of options to consider. Tourism, casino gaming and healthcare are the biggest economies in Hollywood. The Memorial Healthcare System, the nation's fifth-largest health care network, is a major employer, as is the Continental Group. High-tech manufacturer HEICO and timepiece manufacturer Invicta Watches are both headquartered in Hollywood, with the latter also basing its customer service call center in the city. Hollywood has a large number of public and charter elementary, middle and high schools. There's a broad range of award-winning magnet programs, which include the Cambridge Advanced International Certificate, STEM (science, technology, engineering and math), Health and Wellness, Montessori and military academy programs. All public schools in Hollywood are served by the School Board of Broward County. There are also a number of private schools and several career schools. Hollywood benefits from the region's strong post-secondary education infrastructure, with options including Florida Atlantic University, Florida International University and the University of Miami. City College, Barry University and Nova Southeastern University also have research and educational facilities in Hollywood. Utilities: Florida Power & Light (FPL) is Hollywood's primary energy provider, while water services are facilitated by the city. Garbage and Recycling: Your trash will be collected twice a week, while recyclables and bulk trash and yard waste are picked up on a once-a-week basis. Transportation: Broward County Transit operates a network of public bus routes that travel through and around Hollywood. Because Hollywood has such a large housing market with so many different options, the price of housing can vary widely depending on the type of home you're looking for. In general, the average price in Hollywood is higher than the state average, and significantly more than the national average. However, that's to be somewhat expected due to its coastal location. Our lowest priced units in Hollywood, FL average $74.00 per month. 1477 people have reserved units in Hollywood, FL in the past 30 days. There are 20 locations within Hollywood, FL's city limits. There are 15 locations in Hollywood, FL that offer AC and Heating features.